The hallmarks of youth are smooth, plump, elastic, and glowing skin. Collagen is a structural component of the skin that provides support and gives youthful shape and contour. The radiance and glow of youth are the result of cell turnover and renewal, and light reflecting off smooth skin. Increased blood flow also contributes to glowing skin by delivering oxygen and nutrients to the skin, keeping it healthy and helping to mitigate damage. As we age, cell turnover and renewal slows down causing dead skin cells to accumulate, which dulls the skin. Environmental factors like smoking, pollution, stress and sun damage break down collagen leading to uneven texture, wrinkles and hollows. 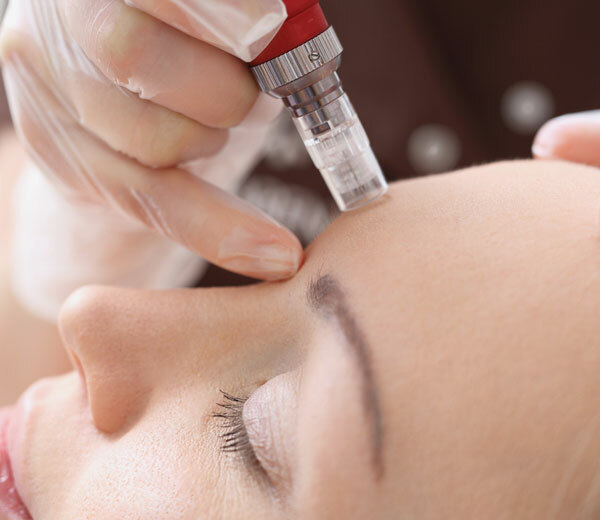 Microneedling is a medical procedure that benefits the skin by stimulating collagen and elastin production and increasing blood flow, which helps reduce the signs of aging. Radiofrequency energy firms and tightens the skin. While microneedling can be performed alone, it can also be combined with radiofrequency heat to give synergistic skin benefits. What is the difference between microneedling and microneedling RF? Microneedling is a procedure that uses very fine sterile needles that penetrate the skin causing micro-wounds that stimulate wound healing. As wound healing ensues, collagen and elastic are synthesized, leading to improved skin texture, tightness and softer appearing acne scars. Microneedling RF combines microneedling with radiofrequency heat energy to amplify collagen and elastin production. Microneedles are inserted into the skin and heat is delivered between the needles to achieve this. Both treatments require a series of treatments for best results and can be safely used on multiple skin types and tones. What are the differences between at-home microneedling and microneedling by an esthetician and dermatologist? For safety reasons because these devices aren’t supervised, at-home microneedling tools tend to penetrate only the very surface of the skin. Because of this, while they may have temporary brightening effects by helping to exfoliate dead skin cells, they typically do little in actually stimulating collagen synthesis and promoting longer-lasting firming or smoothing effects. In addition, at-home devices may or may not have disposable tips or a mechanism for sterilization. If needles aren’t clean, bacteria or other microbes could be transferred into the skin risking infection. In contrast, in-office devices have sterilized disposable tips and have multiple depths of penetration. This allows needles to reach into collagen, elastin, and superficial blood vessels promoting tissue remodeling, which can tighten skin, improve texture and minimize acne and other scars. Does either procedure increase the risk of pigmentation issues, and limit the types of skin tones that can be treated? Both treatments are safe for multiple skin types and tones. The radiofrequency heat as well as needle depth are adjustable and tailored specifically to the location on the face or neck that is being treated as well as for the color of the skin. For darker skin types, this is a major advantage over many lasers, which cannot be safely used on these more pigmented skin tones. Is there a difference between the areas that can be treated with microneedling vs. microneedling RF? No, both microneedling and microneedling RF can be used to tighten many areas of the skin, improve circulation, and soften acne scars. Can microneedling RF achieve results similar to laser skin resurfacing? Microneedling RF is designed to be a less invasive procedure that requires a series of treatments to target fine lines and tighten skin. In general, results are more subtle than those that can be achieved with laser resurfacing. Laser resurfacing, especially with the fractionated CO2 laser requires 7-10 days of healing, whereas microneedling RF treatments usually cause a few hours to one day of minimal swelling, which is very attractive to those with busy lifestyles. In addition, whereas laser resurfacing cannot be safely used on darker skin, microneedling RF can serve as a safe alternative. Can you please explain the benefit of adding platelet rich plasma to both traditional microneedling and microneedling RF? Platelet rich plasma (PRP) is a highly concentrated form of platelets and other healing factors derived from a patient’s own blood. Adding PRP topically to the skin after microneedling and microneedling RF accelerates recovery and can improve overall cosmetic outcome by enhancing wound healing. A patient’s blood is drawn, platelets are isolated through a very precise spinning process using premier German technology, and then they are applied to the skin after microneedling, microneedling RF or laser resurfacing. PRP travels down the micro-wounds created by these procedures to better penetrate the dermis layer of the skin where they enhance healing, collagen, and elastin synthesis. PRP is completely natural and nicely compliments these procedures. Which is better to treat acne and acne scarring? Both can be helpful for acne scarring using a series of treatments. The added RF can give synergistic effects, which often leads to fewer treatments than microneedling alone.